If you are a makeup lover or are just looking to update some of those suspect concealers and foundations that have been hidden in the bottom of your bag since 2009 then you will be excited to know that renowned makeup artist and Oprah favorite, Bobbi Brown will be hitting up Lord &Taylor’s this week. Recently Lord & Taylor opened up their new cosmetics section located on their main floor, one of the new counters is Bobbi Brown. 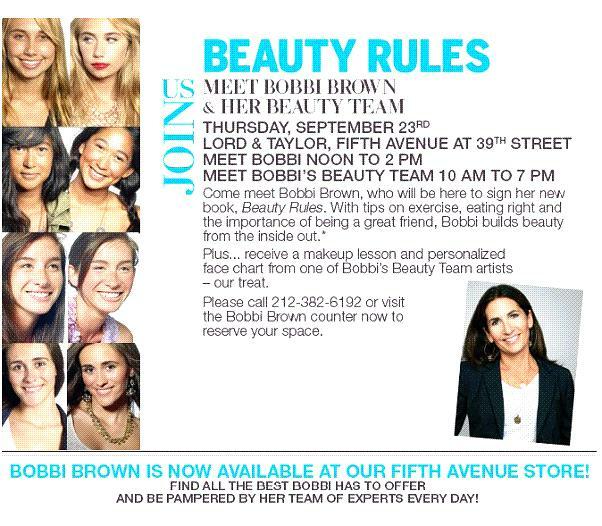 In celebration of the opening of Bobbi Brown’s new counter at Lord & Taylor, on Thursday, September 23rd, Bobbi Brown herself will be coming in and signing copies of her new and sixth book, Beauty Rules. Bobbi will be in the store from noon-2:00 pm, however, her beauty team will be on hand all day to give makeup lessons! There will also be a special ceremony before the event with Bobbi to acknowledge the new addition. I for one can attest to her makeup as well as her makeup artists. I was at a L&T event a month ago and her team hooked me like no other. As a deep dark skinned woman I can never find the right makeup or colors that work for my complexion and her makeup was perfect for me. The colors were great and it was as if I was not wearing any makeup. My skin was glowing and the makeup was so light. This event was definitely worth checking out.